Probably the best return on your roofing dollar is from a roof maintenance program. 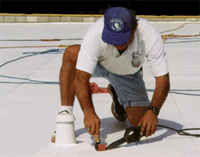 An inexpensive roof maintenance program can identify problems at an early stage and head off expensive repairs. The idea is to prevent leaks and not to simply patch them after a leak has occurred. A planned maintenance program ensures that the roof will be examined on a regular basis and not ignored until a problem arises. Maintenance programs can be tailored to the customer’s needs to include gutter cleaning and leaf removal. Customers with maintenance programs receive top priority for service after a damaging storm. Finally, roof maintenance extends the life of your roof. Delaying an expensive re-roofing project for a few years greatly increases the return on the investment in the original roof. ESMAC maintains a list of its maintenance clients and inspection dates in its computer system. This prevents the missing an inspection. This listing also allows the scheduling of inspections in groups and in conjunction with other work. This makes the process very efficient and keeps the cost low. The inspection is guided by an inspection form which is filled out by the inspector and returned to the owner.